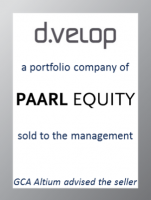 GCA Altium acted as exclusive financial adviser to Paarl Equity on the sale of d.velop, a leading independent provider of Enterprise Content Management (“ECM”) software solutions in Germany and Europe. The transaction once more highlights GCA Altium’s outstanding M&A expertise in the software sector and has been the 28th successfully completed transaction in German-speaking Europe in the last 12 month. GCA Altium acted as exclusive financial adviser to Paarl Equity in this transaction. The financial terms of the transaction will not be disclosed.